I am back from school and while my body is back, my mind sure is somewhere else right now. Still processing all what I have gone through in school, so I need some time to recuperate. It was long hours of counseling and all I can say is WOW!!! I had so many amazing realizations, I wish everyone could go through what I have gone through in school so far this past year. And next year will be even more amazing! I am sooooo ready!!! And I can say LIFE IS GOOD!!! We live with so many limiting believes we bought into in our lifetime and if we find the roots of them, we can totally realize, those are just stories we believed, and it's all up to us to let those go. I am working my way to let them go, as they sure haven't served me in the past....hehehe..and I want a different experience in my life, compare to what I have had in the past. This was amazing as 260 people, including myself, sure have gone far in my school, during our lab, so it was so fun to see this stamp and I can't wait to get my hands on the new kit. Oh, and I forgot to mention a little toot, so I will insert it here. Angela liked two of my layouts and asked to take them with her to CHA to show off use of the Unity stamps. So, while I didn't get to go to CHA this time, I was tickled pink, needless to say, as I really love playing with their stamps. Anyway, enough yapping...hehehe. I have a card to share with you, can you believe???? I did make a card and it is for tomorrow, as it is Friends day, did you know? So, perhaps you can make a card for your friends! 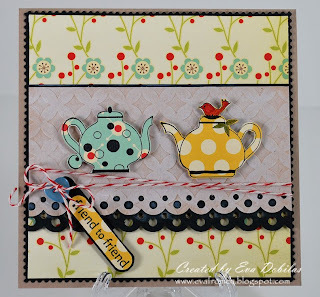 This is my monthly challenge at Treasured Scrapbooking, so if you make a Friends card, please come stop by and share what you made, I sure would love to see and I know the lovely TS ladies would love to see as well. Ok, that is all I have to share with you. I used Cosmo Cricket papers, Unity Stamps (June kit of the month) and brand new Quickutz embossing folder....just bought it today and had to play with it. By the way I had such a fun time today, I met a scrappy online friend in real life. We had a great lunch and chatted a few hours, went to a LSS and ran into the brand new Quickutz embossing folders and three of them decided to come home with me. I couldn't say no when they were 30% off...hehehehe. Karen, if you are reading this, I had a fabulous time meeting you and hope to see you more! Well, have a lovely rest of the weekend!